Genießen Sie den Blick auf Muskegon Lake von jedem Zimmer im Haus! Bonfire Grube im Hinterhof mit all den Split Brennholz und Anzünden Sie wollen oder brauchen. 4 Schlafzimmer - 1 King - 2 Queen - 1 Liege mit ausziehbarem Ausziehbett. Wir haben auch ein Pack-n-Play. Komplett eingerichtete Küche mit neuen Geräten und Topftopf, Kaffeemaschine, Toaster, Grillplatte. Netflix ist auf einem Flachbildfernseher verfügbar. Der nächstgelegene Bootsanleger befindet sich 3 Unterkünfte entfernt und der Bootsanleger des Muskegon State Park Snug Harbor ist 0,5 km entfernt. Brandneues Dock für 2019. 15 Minuten von Michigan Adventure. Nicht rauchen im Haus oder auf dem Grundstück. Ideal für ein Familientreffen oder einen entspannten Familienurlaub. Check-in 11 Uhr und Check-out ist 16 Uhr. So much bigger than than the pictures. Lots of parking for our reunion. Easy to find. Close to everything.So clean. Cathy was wonderful. Loved the view. Can't say enough. Plenty of seating in and out. We have stayed at three HomeAway houses and this was the best! Thanks! We’re glad you enjoyed your stay. We had a great time with 6 people in this cute, nicely remodeled home. Unfortunately the weather was bad while we were there, but we were still able to do most of what we wanted to do. The house was clean and comfortable and the owners were very easy to get in touch with when we had a question. My family and I enjoyed our stay at this property. The home is updated, clean, and comfortable. The backyard and view are very nice. Proximity is close to Michigan’s Adventure, Pere Marquette beach, and several restaurants. Would stay again! Perfect place for our family to get together and great location too!! Loved kayaking and canoeing on Lake Muskegon and being on the beach at Muskegon State Park on Lake Michigan - which is just down the road!! Property was well maintained and clean. Beautiful location, close to everything. Me and my family stayed here. We met Cathy, she was extremely friendly. The location was very beautiful and centrally located. We loved the view from the back yard (sits right on the lake) so much that we ate outside the whole time we were there. We have family in Muskegon and they were just as impressed with the home and location as we were. 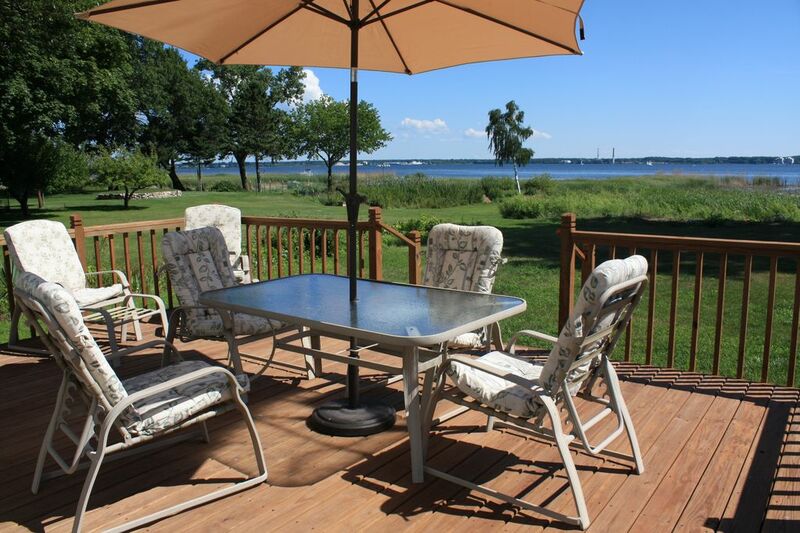 If you love sitting outside with a view of the lake... this place is for you. Ideal für einen erholsamen Urlaub auf dem Wasser und in der Nähe von Stränden!